Have KFML memories or additions to share? Drop us a note! NEW!Super Warthog Show an audio snapshot from 1968! When you're done here, check out these websites for more on KFML! KFML tended to be unpredictable with each announcer playing what they felt, without reprecussion... well, almost. "Up against the wall, M.F's" was a little tough to explain to Joe McGoy, the owner. Listeners could expect the unexpected, from contemporary pop artists to the roots of the blues. From in studio performances by a folk rocker like Eric Anderson, to electric poets. "KFML broke down rather simply. Thom Trunnel took an intellectual approach to music programming. Well thought out, methodical presentation. He loved the Stones, good but little known English bands and jazz cats like Gato Barbieri. Jerry Mills was all about bluegrass and Martin Mull. Steve Burke was also a jazz guy, but very melodic in his presentation. He liked to play a lot of unknown rock and roll, both songs and artists. Brian Kreizenbeck did late nights and loved anything garish. Zappa, Blodwin Pig, Queen, etc. My background was Stax/Volt, Excello, the Midnighters, The Spiders etc. I have always been a sucker for anything with a melody and a great big hook. Jerry Mills and I also played a lot of folk stuff that would get you killed today....Baez, Lightfoot, Tom Rush and more. KFML also was peppered with great roots blues artists. Muddy Waters, Memphis Minnie, etc. It was very eclectic, but it also rocked it's head off, you just had to listen more than half an hour. It could be delicious or wretched sometimes, but there was nothing else quite like it..."
"This is, of course, a simplification of what we were all about, individually and collectively. I was blessed to work in the midst of such a talented group, who invidually tried every day to defy being categorized. There were days when we exhibited none of the the traits that I have just assigned to us.. The music sets were not just random seques, but a conscious effort to weave stories, textures and themes. Just like a band, we fought and we created. There was enormous energy imminating from this dedicated, manic group, functioning together daily in the drug drenched environment of KFML at the corner of Third and Fillmore. Only those who were in the initial group will ever know what it was really like." "I joined the team at KFML in Spring 1971 and continued for a year until differences with Thom Trunnel required us to part ways. This is despite the fact that I was nominated for a George Foster Peabody award for news coverage of racial incidents at Lowery AFB in Denver and later at the USAF Academy in Colorado Springs. I pioneered the news format that mixed relevant music with news items. It was an enormously exciting time for everyone, and the freedom to put this kind of material on the air was a total natural high". KFMLs' studios often hosted famous recording artists as well as up and comers. Scheduled and even impromptu concerts were a treat to listeners. 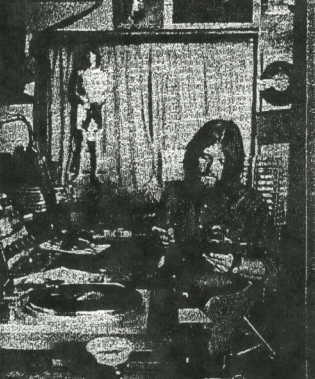 Some concerts and interviews wound up on the bootleg market, including King Crimsons' March 12, 1972 concert... released as the album "Strange Tales of the Sailors"
Listen Up Audio frequently taped shows at Chuck Morris's "Ebbets Field" at Brooks Towers and the shows were broadcast on KFML. 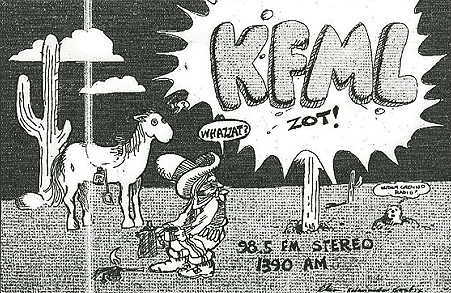 Owner Joe McGoy sold off the FM in 1970 which became at one point-KIMN-FM and now is country KYGO-FM. The format remained on the AM for a few more years, but with perhaps a shade less of the original spirit. 1390AM is now home to KJME, a spanish language station. Call them "Hosts", "Announcers" or even "Heads", but just please don't call them "Disc Jockeys"! John Sutton (late 70's, early 80's-host of "Jazz Excursion"